Discovery College is an authorized International Baccalaureate Primary Years Programme (PYP) school. This programme offers our school a philosophy and curriculum framework which aims to combine the best research and practice from a range of national systems with the wealth of knowledge and experience in international schools. 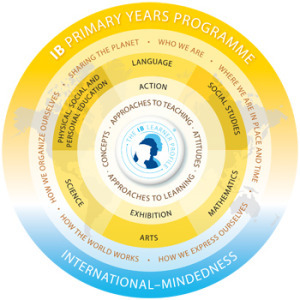 The IB Primary Years Programme, for students aged 3 to 12, focuses on the development of the whole child as an inquirer, both in the classroom and in the world outside. It is an international, transdisciplinary programme designed to foster the development of the whole child, not just in the classroom but also through other means of learning. The PYP focuses on the total growth of the developing child encompassing social, physical, emotional and cultural needs in addition to academic welfare. The PYP encourage the development of the traits described in the IB learner profile. It describes the qualities IB students develop and display as they learn. Find out more about the IB Learner profile here. The six transdisciplinary themes help teachers to develop a comprehensive programme of inquiry with in-depth investigations into important ideas, identified by the teachers, and requiring a high level of involvement on the part of the students. These inquiries are substantial, in-depth and usually last for several weeks. Find out more about the PYP curriculum here. This promises to be another exciting year in the Primary School. Please download a copy of our Programme of Inquiry to find out what’s in store for all the year levels.